… Greater London Authority (GLA) planners found the tower failed to follow the London Plan for several reasons. 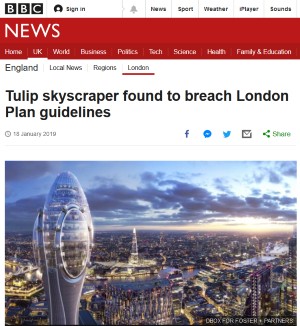 Part of the London Plan calls for free access to public areas in tall buildings but most visitors to the flower-like tower would be charged an entrance fee. The building was found to ‘harm’ views of the Tower of London, while also creating a ‘confined’ and ‘potentially unsafe pedestrian environment’ around the bottom of the tower. Planners also questioned the ‘highly distinctive design’ saying it would ‘appear incongruous’ in the location, while also calling its height ‘unjustified’.